As of this post, donations have surpassed the $5000.00 goal. 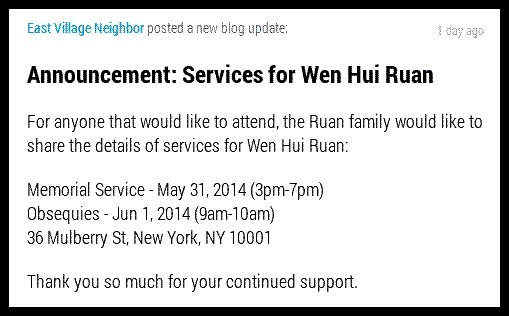 Still, if you’d like to make a donation to Ruan’s family, you still can. My thoughts on the “random” assault, death of 68-year old Chinese immigrant in Alphabet City If you can, attend today’s public memorial for 68-year old Wen Hui Ruan Is Kennedy Fried Chicken on 14th street closed for good?